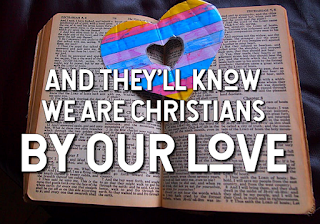 This song about Christian unity and social justice was written by American Roman Catholic guitarist, folk-musician and and at-the-time priest Peter Raymond Scholtes (1938-2009). It was created to provide material for ecumenical, inter-racial events including a choir of disadvantaged youth (ref). The core message is based on John 13:35 "This is how all will know you are my disciples ... "
The song was initially included in volume 1 of the Hymnal for Young Christians, arranged by the editor, Denis Fitzgerald, published in 1966 (ref Keep the Fire burning). It is included in McCrimmon Publication's Celebration Hymnal for Everyone, and sheet music is available for immediate download (SheetMusicPlus link below). Alternative titles include "They Will Know we are Christians" or "We are One in the Spirit" - or more recently By Our Love. The tune, also written by Scholtes has been called ST BRENDAN'S in some publications, in honour of the Chicago south-side parish where Scholtes was associate pastor. It has a 4/4 time signature, and in the key of Fm, the first few notes are CE F FEFA. It has the style of a Hebrew folk-tune but has not been identified as one in any publications. Although the song has become far less popular in liturgical churches, it has crossed denominational boundaries and more recently has been recorded by various contemporary-Christian-music artists, eg Jars of Clay, King and Country. It is also used in youth-ministry in various developing countries. The original recording left out the fourth verse - presumably because of limited space on the record - and it has been left out of many subsequent publications and recordings also. The original third verse refers to "each man's dignity" and "each man's pride" - in some circumstances this is changes to "each one's dignity" etc. Digital-download 2-part voice arrangement by Gregg Sewell, Triune Music.